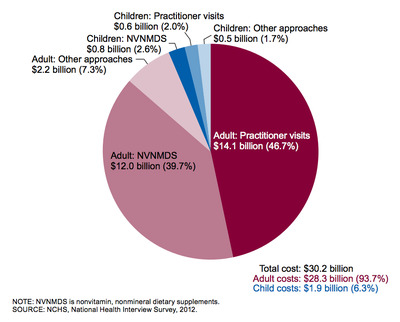 Americans are spending billions of dollars out of pocket for what’s considered “complementary health” approaches. A report released Wednesday by the Centres for Disease Control and Prevention looked at data from the 2012 National Health Interview Statistics and found that Americans spent $30.2 billion a year on healthcare that falls outside mainstream medical care. That encompasses everything from acupuncture, to yoga, to natural product supplements. That $30.2 billion represents just 1.1% of total healthcare spending in a year, the CDC noted. But, when looking just at out-of-pocket costs (or what patients are actually paying after insurance, etc. ), it made up 9.2% of total costs per year. That’s on par with what people are paying for doctor’s visits and prescription drugs, the report concluded.